Please call our office on 01487 500064 before purchasing any of our items for the most competitive price, we are always happy to do our best to make the customer happy. 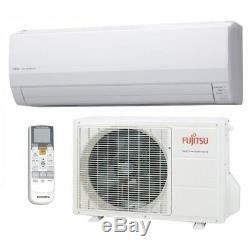 Fujitsu Inverter air conditioning split system 5.2 kw system. Wall mounted unit (very nice looking). 5.2kw cooling - 6.3kw heating. Would suit a large living room, dining area, conservatory or office. The units are extremely quiet in operation and provide excellent all round comfort. Using Toshiba's twin rotary compressor technology the units provide high energy efficiency heating and cooling performance. Please read this important information before purchasing. All split, twin and multi air conditioning units contain F-gas, and is governed by F-gas regulations. Under EU regulations: The installation of all systems containing F-gas (R410A, R32 or R407C) require installation or commissioning by a F-gas certified air conditioning engineer. MUST NOT BE ATTEMPTED IF YOU ARE NOT QUALIFIED. 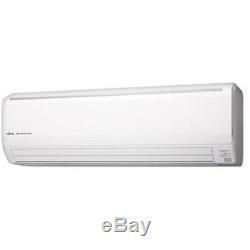 The item "Fujitsu Air Conditioning 5.2kw Wall Mounted Heat Pump Domestic Air Con Unit" is in sale since Thursday, March 15, 2018. This item is in the category "Home, Furniture & DIY\Heating, Cooling & Air\Air Conditioning". The seller is "greenclimateservicesshop" and is located in Huntingdon.